Everyone loves nurses, right? WRONG. Everyone loves nurses until they're like, "Wait, actually, I think for no scientific reason that you definitely have Ebola, so please sit alone for like three weeks with only your probably-not-Ebola-infected pet, an endless supply of ChexMix and your dwindling Netflix queue for company." As she's previously established, Kaci Hickox is not going to abide by your excessively strict quarantine rules that she knows better than you do are unscientifically founded. 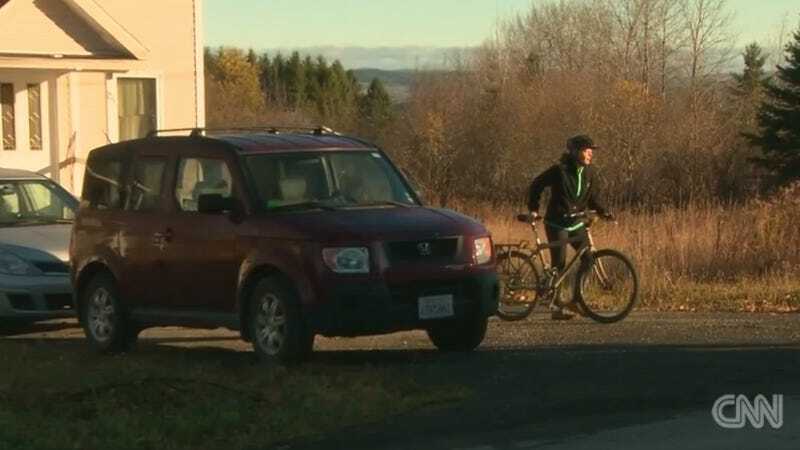 "It's a beautiful day for a bike ride," Hickox said Thursday morning, according to the Bangor Daily News, before pedaling off with her boyfriend, who also probably doesn't have Ebola. Maine Governor Paul LePage has followed in the footsteps of a brilliant man, New Jersey Governor Chris Christie, by stating that Maine will try to legally enforce a 21-day quarantine for Hickox. The Maine State Police is watching her as well. "It is not my intention to put anyone at risk in this community," said Hickox in front of her house Wednesday evening, according to WLBZ. "We have been in negotiations all day with the state of Maine and tried to resolve this amicably, but they will not allow me to leave my house and have any interaction with the public even though I am completely healthy and symptom free." She's still highly concerned with how other medical professionals coming back from West Africa will be treated when they return, as is the American Nurses Association – the organization supports her cause. If you'd like to see more photos of a presumably healthy woman biking, head over to the Bangor Daily News.